How do you reposition the brand and concept of Caixa Insurance Company, one of the biggest insurance providers in Brazil? Creating a brand image as an insurance provider for all Brazilian people and, even more, as a highly regarded helper in taking care of their clients' lifetime achievements. To identify personas we did some presencial interviews with people from all over the country. The questions were about life, home and car insurance. The main research idea was to understand if the prices were fair enough relative to the differences in earning. After hearing from them that insurance is for rich people, we discovered that we needed a 180º shift in the company's discourse. So they decided to talk more with the lower and middle classes. We created a campaign based on true stories. The main purpose was to resonate with the target audience by showing that these stories could happen to anybody. 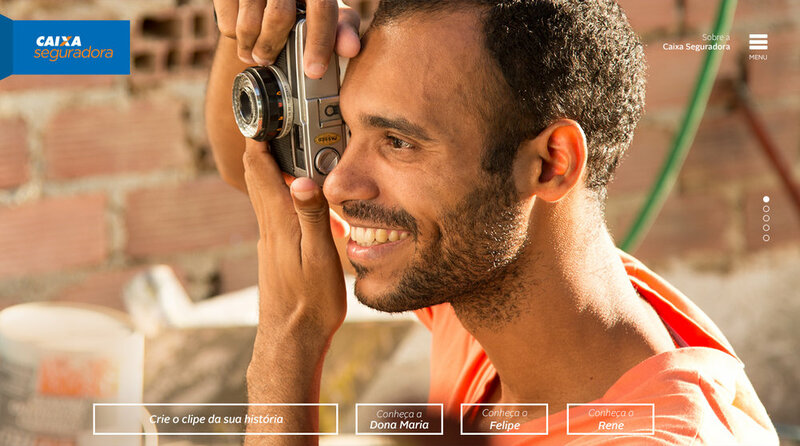 These stories had a special soundtrack made exclusively for this campaign by Brazilian hit singer Ivete Sangalo. All the stories were placed on a landing page and linked to their products. Brazilian people have always been open to interact with the brand on social media. Because of that, social networks were a big part of the campaign. People were invited to visit the website via offline media. There it was possible to watch short documentaries and know more about these people's lives, which created a deep and true interaction with the brand.